Helen Adams Keller (June 27, 1880 - June 1, 1968) was a deafblind American author, activist and lecturer. 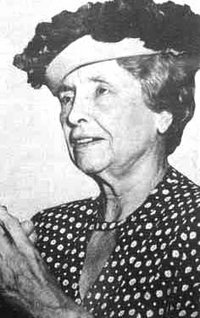 Helen Keller was a member of the Socialist Party and actively campaigned and wrote in support of the working classes from 1909 to 1921. She supported Socialist Party candidate Eugene V. Debs in each of his campaigns for the presidency. Her political views were reinforced by visiting workers. In her words, "I have visited sweatshops, factories, crowded slums. If I could not see it, I could smell it". "At that time the compliments he paid me were so generous that I blush to remember them. But now that I have come out for socialism he reminds me and the public that I am blind and deaf and especially liable to error. I must have shrunk in intelligence during the years since I met him.Oh, ridiculous Brooklyn Eagle! Socially blind and deaf, it defends an intolerable system, a system that is the cause of much of the physical blindness and deafness which we are trying to prevent". "I was appointed on a commission to investigate the conditions of the blind. For the first time I, who had thought blindness a misfortune beyond human control, found that too much of it was traceable to wrong industrial conditions, often caused by the selfishness and greed of employers. And the social evil contributed its share. I found that poverty drove women to a life of shame that ended in blindness".